The final two weeks until the opening of deer season just got a whole lot longer. 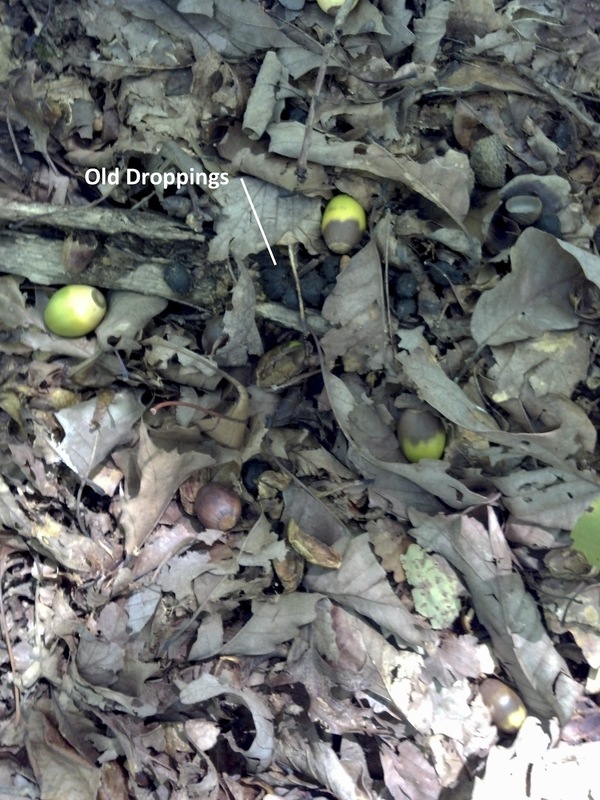 Yesterday, I checked on the chestnut oaks that I wrote about in this post. Last time I was there, I had discovered that the trees were loaded with acorns. I was curious about whether they had started dropping yet. Oh my gosh! 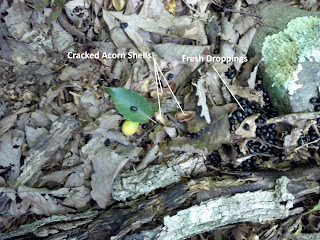 The acorns were dropping and the deer were absolutely hammering them. If the season were open today, I would 100% guarantee a sub-20 yard shot at multiple deer. And the best news is that there is at leat one buck using the area. The rub pictured above was very fresh. Notice the shavings on the ground. It was on a tree that was about as big around as my wrist. 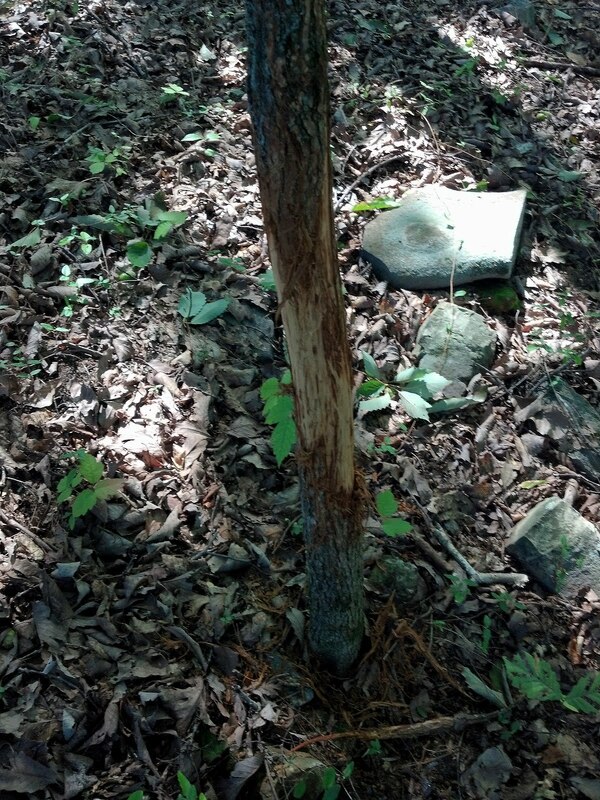 A rub that size is much larger than what I normally see this time of year. Click on any of the photos to see a larger view. Click on the "X" in the upper right corner to return. There were several other rubs on trees ranging from one to one and a half inches in diameter, which is much more typical for early season feeding rubs. My theory on clusters of rubs at this time of year is that they are not made for communication, like like they are later in the year. Of course no one knows what goes through a buck's mind, but I believe, after observing lots of them around dominant trees, that the smaller rubs they make in feeding areas is just a case of boys being boys. Bucks will casually feed around on acorns and if they get close to a small tree, they will pause to try out the new headgear. It isn't aggressive rubbing. It's almost like they are just bored. Normally they don't pick on trees much bigger than thumb-size, so I'm pretty excited to see if larger rubs mean larger deer. It's probably just a six-pointer with an attitude, but I'm going to remain hopeful for another two weeks. As exciting as it is to see a cluster of rubs, the thing that really got me fired up was the quantity and concentration of feeding sign that I found in the area. There were cracked acorn shells and fresh deer droppings everywhere. In an area about the size of a half basketball court, there was literally no where you could stand and not see deer droppings. It was unbelievable. Here's the problem though. 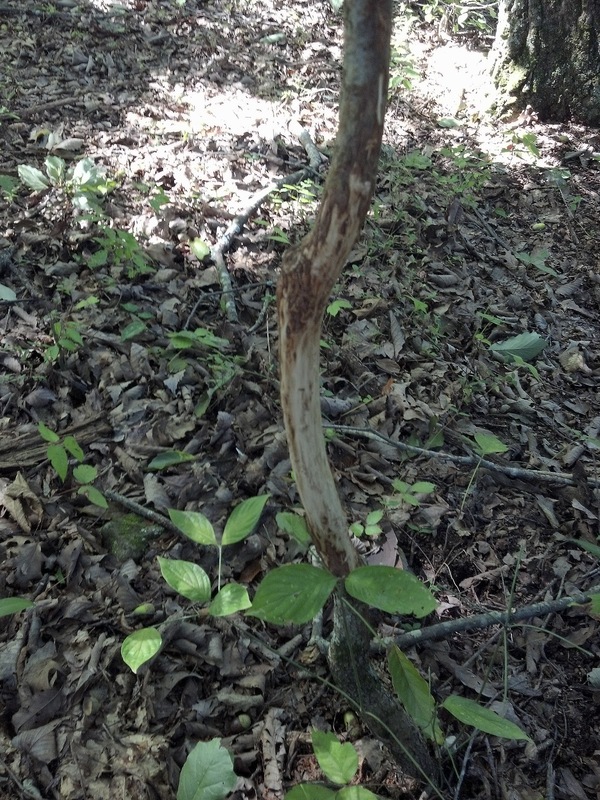 Deer season is still two weeks away, and a lot can change in that time. The acorns can all fall and be consumed. Although with the number of nuts on the ground and still in the trees, that isn't too likely. 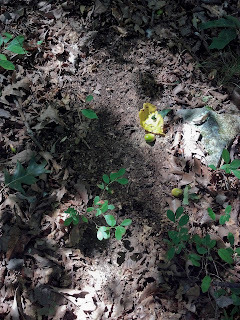 A greater risk (as far as hunting this particular spot is concerned) is that some white oaks will start dropping nearby and the deer will change their pattern. 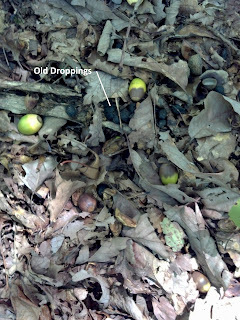 Even though the deer are hammering the chestnut oaks right now, they are their least preferred acorn. If they have any other option, they will take it. If I do, it will mean that they have moved on and it would be a waste of time to hunt there. Sooner or later, it is going to happen. I just hope that I get a chance to hunt this spot before it does. 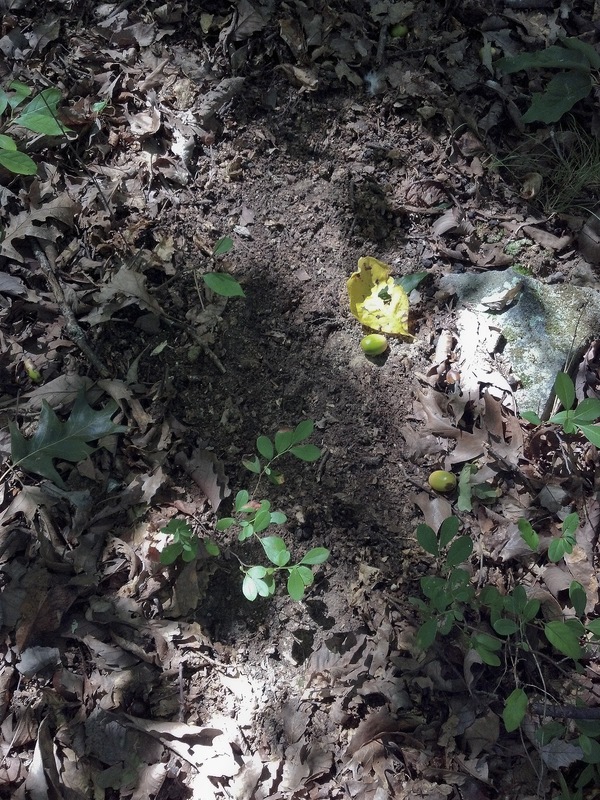 If not, I will enjoy the challenge of figuring out where they've gone, which for me, is the best part of deer hunting. Another great/informative post. 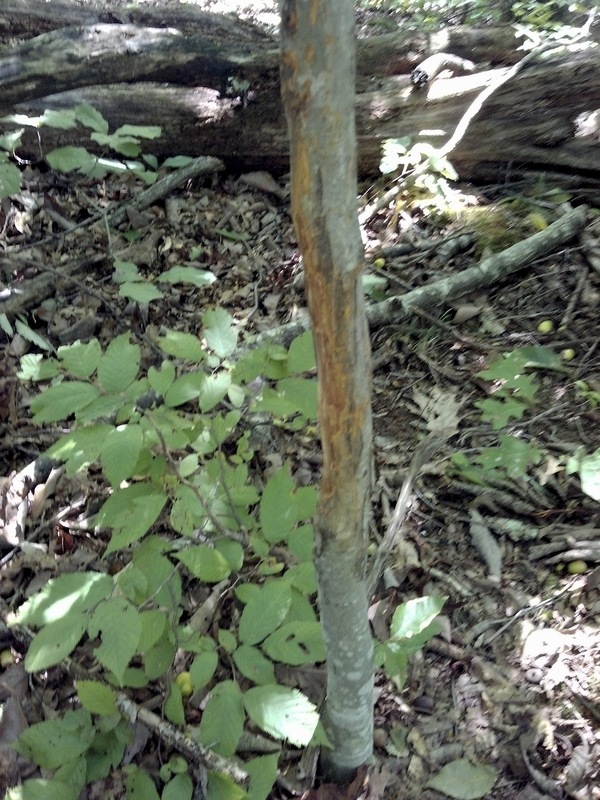 I was wondering if anyone was seeing rubs yet or if they just haven't started in my neck of the woods. I'm in North Louisiana and have scouted roughly 3000 acres the past 2 weeks in preparation for the upcoming bow season and have found loads of nice white oaks that I can't wait to hunt. However, I haven't seen the first rub anywhere. It's really starting to make me wonder if they're still in velvet or if I just haven't seen the rubs. The latter I'd really find hard to believe considering how much ground I've covered.